Wuzhen Town (Wu Town), in Tongxiang City, Zhejiang Province (about 75km away from Hangzhou; about 90 minutes by road from Shanghai), is one of six ancient water towns which located in south of Yangtze River with 1200-year-old history. There residential houses are built beside rivers, while on both sides of streets, abundant ancient architectures of Ming and Qing Dynasties still remain as they were. 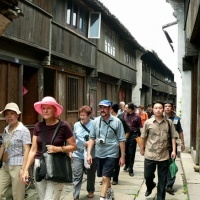 Strolling along the ancient slabstone-paved streets, looking at its black tiled, tung oil painted timber framework houses, it seems you are walking into a traditional Chinese wash painting and experiencing an atmosphere of antiquity. In Wuzhen you can pay a visit to Jiangnan Hundred Beds Showroom, Indigo-Blue Printed Calico Workshop, Mr.Yu Liuliang's Coin Display Room, Shadow-puppet Theatre, Ancient Stage, Pawn Museum, Visiting Lu Pavilion, etc. Wuzhen Town admission fee is 100RMB. 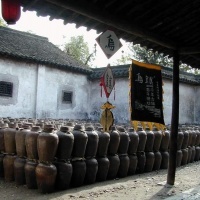 Tradition is still very much alive in Wuzhen. In addition to flower-drum opera, Shadow-puppet shows, and temple fairs, Wuzhen also attracts visitors with its time-honored art of making indigo-dyed printed calico. In ancient times, indigo-dyed printed calico was used for curtains, scarves, and tablecloths in every household in the countryside of Zhejiang Province. Today, it is still common to see old women in indigo-blue gowns leisurely operating spinning wheels or looms at weaving workshops in the old lanes of Wuzhen, while the squeaks of the looms resound throughout the lanes. Carrying o-n this tradition has become a part of the lives of the old women. 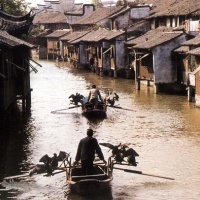 The name "water town" is especially apt; besides lying on the Grand Canal, the settlement is completely encircled by two rivers - the Dong Shi and a smaller tributary, which meet at a T-junction. No matter where you stand, water provides the backdrop. Maybe the finest building in old Wuzhen is the "Water Pavilion", built on a wooden platform atop stone pilings sunk into the riverbed. The Pavilion overlooks the Grand Canal, that magnificent waterway running a full 1800 km from Beijing to Hangzhou. While parts of the Canal north of the Yangtze River are now silted up, the 500 km section on which Wuzhen is situated is still in continual use, with a constant stream of barges carting wood-chips, building material, passengers and other cargoes. All the buildings in Wuzhen are in Ming or Qing Dynasty style. 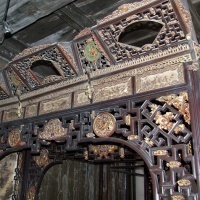 One palatial establishment is the "Double Happiness" Marriage Shrine. Twin hearts are joined in a nouveau-Chinese character in gilt upon a flaming crimson background, presumably depicting the inseparability of marriage.